Photo courtesy of The Circle and IPTF. The Indigenous Peoples Task Force (IPTF) has launched a new program to help prevent youth suicides. Native youth have the highest rate of suicide in comparison to youth of other racialized groups, and it is the greatest risk of death for Native people in this age group. Unlike other prevention programs in the state, the program is culturally specific and will focus on learning the signs of suicide and encouraging the community to lean on and support each other through honest communication about suicide and mental health. “It’s hard to think of a specific suicide prevention program in Minneapolis for Native youth. 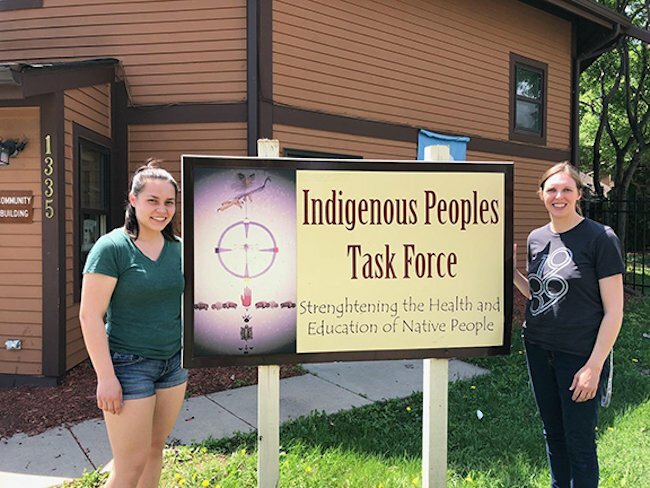 There are a variety of long standing programs in Minneapolis improving the health of Native youth, but suicide prevention isn’t talked about directly,” said Brenna Depies of IPTF. Find out more at The Circle News. In the largely white-owned culinary scene, soul food has had a difficult time taking hold of food audiences in the Twin Cities. Onyx Collective, a group of black chefs formed this year, are hoping to revitalize soul food in Minnesota, hosting a series of monthly pop-ups this summer at Breaking Bread Café, a black-owned soul food restaurant in Minneapolis. Each pop-up will center a different aspect of Black history or culture, including an exploration of Minnesota’s own Prince and his vegetarianism. Despite outsider concerns that the collective model will hurt the group’s prospects, Onyx Collective embraces the cooperative mindset and adds that the shared experience of being black in America makes their group an invaluable support system. “This is the first time, in 46 years of cooking, I’ve seen so many black people in one place,” said chef and Onyx Collective member Vaughn Larry. Read more about the pop-ups and Onyx Collective at Insight News. North Hennepin Community College has hired Nerita Griffin Hughes, the college’s first black dean. Hughes says her faith is a guiding force in her life and choice to take the job, and she sees the dean position as a step toward one day fulfilling her dream of becoming a college president. Learn more at the Minnesota Spokesman-Recorder. “Hustling is in our blood,” Chef Yia Vang said. “I’m not doing anything different than what my parents and my grandparents were doing in Laos and Thailand.” Vang operates Union Kitchen, a Hmong American pop-up restaurant, alongside his cousin Chris Her. This week: Seward Co-op workers march for right to unionize, transit fare hikes for Metro Transit and a look at a Native-run media production company and youth training program.